Next month, you’ll be able to use a single wireless keyboard with just about any mobile device, regardless of the software platform it uses. The keyboard is coming from Microsoft, of all places. 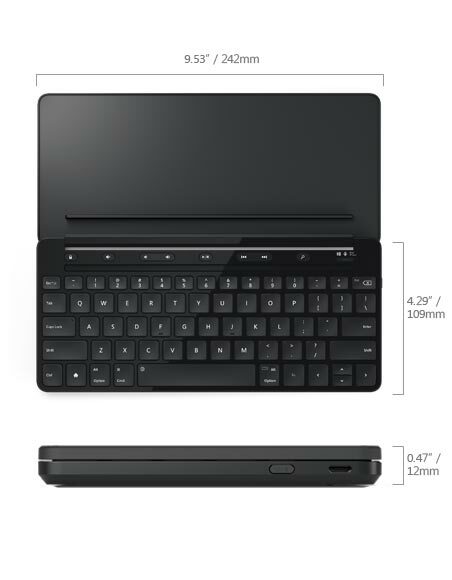 The company announced its $79.99 Universal Mobile Keyboard on Tuesday, saying that it will be available in October. After years of seeing wireless keyboards from Microsoft that required proprietary dongles or attachments, the Universal Mobile Keyboard is refreshing. It uses a standard Bluetooth connection and will work with any mobile device that supports the Bluetooth Human Interface Device (HID) profile. That means you can use it with a Windows 8.1 or RT tablet in the morning, type emails and web searches on an Apple iPhone or iPad in the afternoon, and finish the night typing away on a Google Android device, all with the same keyboard. That’s not an entirely new concept for other keyboards, but it is for one coming out of Redmond. And to prove that Microsoft is really thinking cross-platform, there’s a dedicated button that returns you to the Start menu in Windows or the home screen in iOS or Android. The Universal Mobile Keyboard isn’t quite full-sized but should be useful for typing on the go: It measures 9.53 inches wide and 12 millimeters thin. The rechargeable battery should last for about six months and there’s an integrated slot in the keyboard cover to hold and stand up a mobile device, so long as that tablet or phone isn’t thicker than 10 millimeters. With support for the various platforms and a standard Bluetooth radio for pairing to and connecting up to three devices, Microsoft’s newest keyboard looks rather appealing.